Clinical psychologist who has gained fame for his expertise on the psychology of religious and ideological belief while a professor at the University of Toronto. His second book 12 Rules for Life was published in January 2018, and topped the Washington Post and Wall Street Journal's non-fiction best-seller lists. He earned his bachelor's degree in political science from the University of Alberta in 1982. He subsequently traveled Europe for a year, where he garnered interest in political psychology, and gained his master's in psychology in 1984. He began recording his lectures and publishing them to his self-titled YouTube channel in 2013, and has since gained more than 1.6 million subscribers. His first book Maps of Meaning's audiobook debuted on the New York Time's audio non-fiction best-seller list in July 2018. He and his wife Tammy share two children. 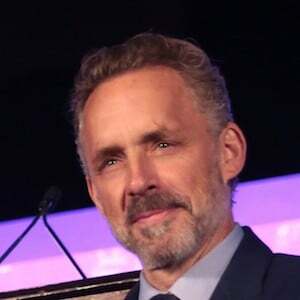 He appeared on Joe Rogan 's podcast in 2018 to discuss his views on psychology and political correctness.